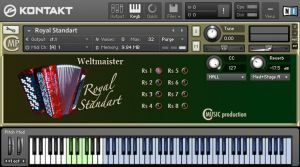 Cmusic Production has updated the Weltmeister Royal Standart library to volume 1.4 for Kontakt 5. The Weltmeister Button Accordion Library is designed to create music. Its single-layer samples are designed to contain depth and character of voicing. The velocity is regulated by modulation (CC1), using a filter (LP1) that continuously varies the timbre as the modulation values change. In this way "hidden" accents can be added to a user's playing style. The Weltmeister provides seven registers for the right hand, and one for the left that includes full bass and chords. Change the amplitude adjusting Convolution Reverb. Use Sustain Pedal (CC64) to contol sound between non vibrato and mechanical vibrato. Intensity mechanical vibrato – CC18. Frequency mechanical vibrato – CC19.